Huge song selection, and feels like a real DJ table! 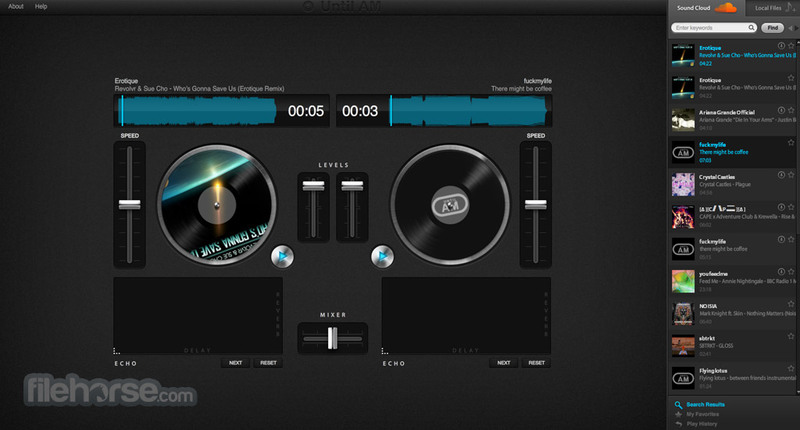 Until AM is a perfect online tool for transforming your ordinary web browser into professional full-fledged DJ setup. With features such as playback speed adjustment, two turntables, vinyl scratching and sound modification with various audio effects, your musical creativity will definitely not be bound and you will not be forced to compromise with quality. All the tools that you need are few clicks away, open Until AM into your browser and become DJ that will fire up party around him. Amazing Online DJ Tool in your Browser! Online tool for DJs and music lovers! Sometimes the simplest approach is the best one. This way of music making was the prime directive of two Finish developers who managed to create one of the best and most streamlined DJ mixing applications that runs directly in your web browser. Until AM manages to give you incredibly simple user interface that features only two virtual turntables that emulate realistic vinyl scratching, just the right amount of tools and visualization elements, and access to one of the largest electronic music databases in the world SoundCloud. Until AM manages to do something that many other web-based electronic music creation apps have failed. While countless other apps are focused on giving you the access to complicated editors where you can assemble brand new tracks or do rudimentary DJ mixing, this app is fully focused on the art of improvisation, scratching, mixing and giving your audience just want they want – incredible live music that they can enjoy. All that and more is given for you in an absolutely free package that you simply have to try out at least once, even if you are complete novice in the world of DJ mixing. Until AM is a DJ mixing application that can be started directly from your internet browser, no matter where you are or what PC form factor you are using. This enables you to stay in touch with your music skills 24/7, with ability to access DJ equipment not only on your PC, but on any PC you get your hands on. You don’t need to install any browser plugin, extension or standalone PC client to use Until AM. Optionally, you can access Until AM via its official Chrome extension. When you fire up Until AM for the first time you will be welcomed with really great interface that features two turntables, small array of must-have tools, and a playlist of songs from SoundCloud that can be enhanced with the songs uploaded from your own collection on local storage. Amazing Online DJ Tool in your Browser! SoundCloud songs can also be downloaded to your PC, if the host of the song allows that. 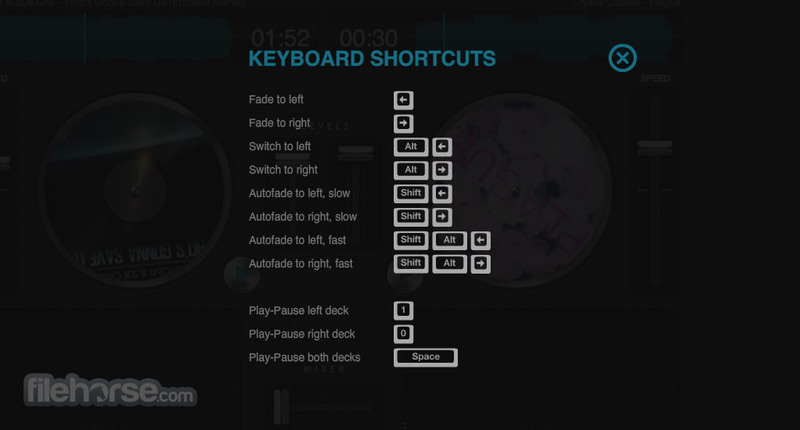 Various functions of the app can be accessed via keyboard shortcuts (most importantly including crossfade), enabling you much tighter control over your mixing process. Even though majority of Until AM functionalities were crafted to be as simple and easy to be used, there are several disadvantages. You cannot use headphones to listen to the track that is currently not active, there is not playlist builder (you have to manually search for next song), there are no loops, cues, autogain, or integration with other popular social networks or music depositories. Additionally, some other web-powered DJ apps enable you to live stream your current session to the entire world. Until AM does not support that feature. Interface of Until AM is in one word – excellent. It features beautiful design style, good layout of turntables and tools around them, and music finder features several ways of sorting and saving songs that you want to find and use. Until AM is free for use for everyone, and it even does not feature any form of account creation or management. 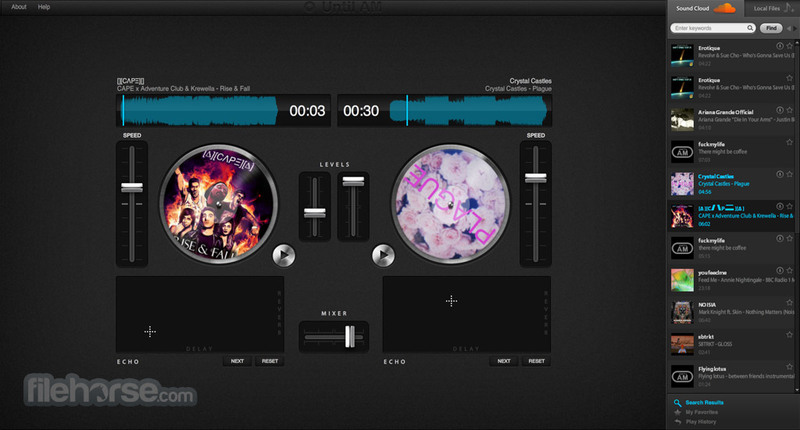 Until AM is a great DJ app for mixing music with two virtual turntables. It does not have absolutely every feature that will enable you to play in clubs and large events, but it can serve as a great music device for smaller events, or as a learning tool for people who want to learn how to mix music. Powerful Online DJ Tool in your Browser! Build your dj set from the massive online selection, or add songs from your own hard drive. Scratch your heart out in the good ol' turntablist style. Add the final touch by tweaking the sounds with a super smooth effects pad. Well thought and minimalistic interface makes deejaying a child's play. Monitor song playback and instantly recognize perfect mixing points. Preload the next song well in advance and avoid silent moments on the dancefloor. BeatlabCan you make sick beats?